Marrakech is home to some of the most interesting restaurants in Morocco. From Moroccan Traditional Fare served streetside to Contemporary French cuisine served on Moroccan salon style seating, Italian Trattoria’s, local Crèperie’s by the dozen, Asian Fusion, Riad three-course dining along with a variety of eats in Djemaa El Fna Square. 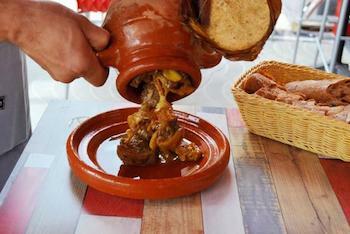 There’s some place for everyone to dine for lunch in Marrakech regardless of budget or taste. There are so many Marrakech restaurants, new and old, that one could spend weeks dining out and just touch the surface of the local food scene. We’ve compiled a list of the Top 10 of the Best Lunch Spots in Marrakech that offer travelers a keen variety of cuisine from the Chic and Savory t0 the Hip and Traditional. A new address in Marrakech, this chic, Gueliz lunch spot is the place to go for those looking for aftternoon or evening bistro fare with a French touch. 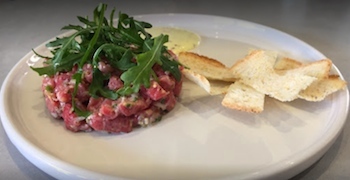 The lunch menu is offered on three courses, pre fixed with option to have a la carte. Waiters present the daily fare without printed menu or pricing. Decor is retro chic. Designer papered walls with zig zag blue and white floors lend to a crisp and unique dining environment. Try the crab and eggplant terraine coupled with seabass ceviche or baked fish with wild rice. This well appointed trendy, Bo-Ho, Luxury boutique hotel in the Medina is the place to be seen in Marrakech. A Branson address and host to the ultra cool, visiting for lunch, a swim and a stop to explore their new home and fashion boutique guarantees an fun filled afternoon outing. The El Fenn terrace restaurant has views of the historic medina and a pre-fixed lunch menu is offered daily. The several-course menu always includes what’s in season. 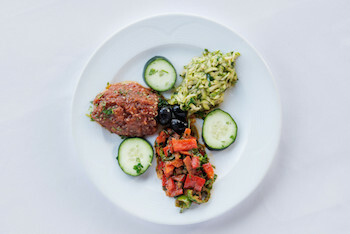 Typical dishes served for lunch are vegetarian salads accompanied by a variety of fresh breads, vegetarian quiche, grilled chicken or fish with a sorbet and lively garnish for desert. El Fenn’s lunch menu is one of the few in town that is perfect for those on who preefer a vegetarian and gluten free diet. An extraordinary dining experience of French, Moroccan gatronomy for discerning foodies. Built into the historic medina walls, this Marrakech luxurious hotel has become a landmark for those interested in classic elegance. The Royal Mansour chef’s table has one of Morocco’s best, created by renowned Michelin 3-star, French Chef Yannick Alleno. Starters, main courses and deserts are beauituflly presented and retain glorious flavors and spices of the Magherb. For those looking to dine on local Moroccan fare in a cozy atmosphere look no further then the Amal Womens Center & Moroccan restaurant. This non-profit organization empowers disadvantaged women by training them in modern cuisine. Amal Center is the perfect go to place for afternoon lunch whether you want a simple tajine or several courses. 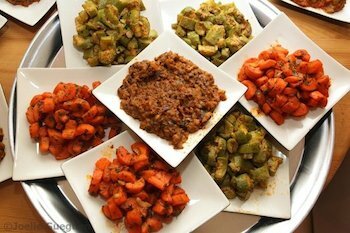 You will be served a Moroccan traditional cuine by women with home made pastries to round out the meal. 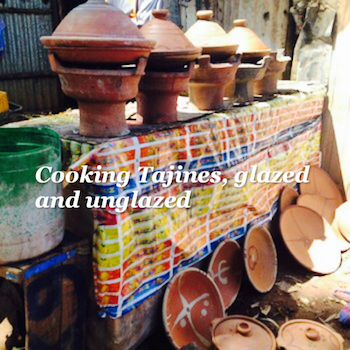 Amal Center also offers cooking workshops and is ideal for those who want to venture on a walk from their riad in the medina to discover the Ville Nouvelle (new town), Gueliz. 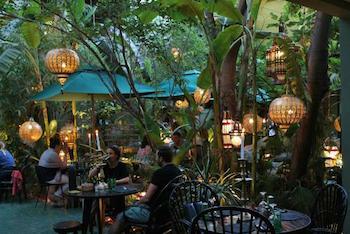 La Familie is a lush, laid back garden and patio restaurant that offers Mediteranean fusion style cuisine. Afternoon grazers who want a slow food experience or to curl up in a lounge chair and sip tea with a magazine in hand will feel comfortable at this boutique out door restaruant located in the heart of the Marrakech Medina. The lunch menu at La Familie changes daily basis – main courses include a variety of salads, home made pasta dishes with a side of couscous. There is also a variety of fruit juices offered. Everything on the menu is made with organic, fresh produce. While the Muezzin call can be heard five times a day and break the calm at this little Oasis, it’s a must eat when in Marrakech during afternoons given it’s only open for lunch. Cafe Clock is the resident cafe in the Marrakech Medina and the most sought after address for local Moroccans, expats and travelers who want to try a camel burger surrounded by local art. The Clock as locals call it is run by British, Expat, Mike Richards, known for his freindly character and as being highly distinguised in the local community. Richards helped to bring back the Moroccan tradition of hikaya, story telling in Djemaa El Fna Square. Cafe Clock is accessible to locals and also offers weekly performances by local musicians. This highly original cultural centre offers a contemporary menu that features original dishes such as goat cheese, quiche, falafel and hummus with mint and carrot dressing along with grilled sandwiches, delicious cakes, tarts and a home made iced-mint green tea that is a must have. 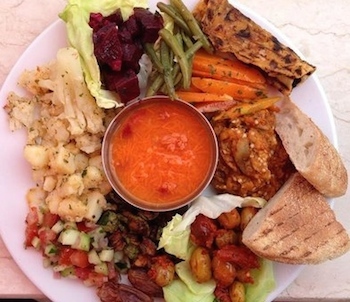 Don’t miss lunching at Cafe Clock in Marrakech. If you do, then make sure it’s included on your bucket list at in Fes or Chefchaouen. The perfect place for a quick, cheap lunch expereince in Marrakech for those longing to take a break from tajine and couscous when on vacation. For travelers who want to forgo a heavy tajine or French fare, a hearty burger is the perfect choice. 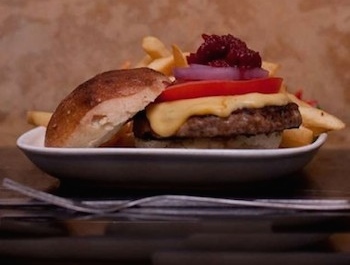 Kech burger serves hamburgers, chicken and fish burgers with fries. A side of slaw is available on request. For fast food lovers this particular place beats the local McDonalds both burger and price wise. A Marrakech landmark, owned by a Breton native that offers a delicious selection of crepes made with buckwheat garnished with a savory or sweet topping. Roquefort, Spinach or chorizo, or the emblematic butter-sugar and Nutella to the subtle variation of suzette oranges. Perfect for those with a savory or sweet tooth. Best crepes in town. 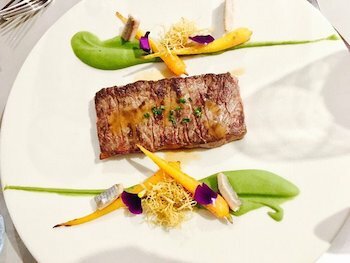 French owned, this Marrakech chic bistro is headed by the young chef Faisal Zahraoui and deserves a big applause for his solid “Cantine.” A perfect lunch can be savored by choosing artichoke carpaccio, the dazzling veal medallion with porcini mushrooms and a chocolate delicacy for desert. A must dining experience for travelers and expats looking for homemade organic cuisine perfect for lunch or early dinner before sunset. This petit restaurant, French owned with a Spanish chef, has both outdoor and indoor seating with a view of the Hart Gardens. L’Atlelier s a wide serves array of hearty salads which can serve as a meal, along with organic chicken, meats such as lamb or duck and fish dishes not to mention many delicious deserts. 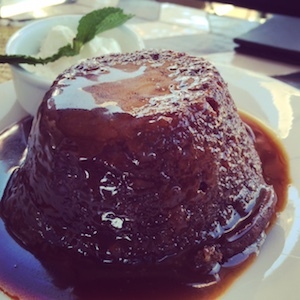 Their three-course fixed price menu’s consist of salad, main and desert. One of the favored ones is Fava bean soup, Chicken confite with lemons and herbes, accompanied by lemon and ginger creme brulee for desert, topped off with an espresso and home made chocolate chip mini cookie. Don’t miss out on this local dining experience.